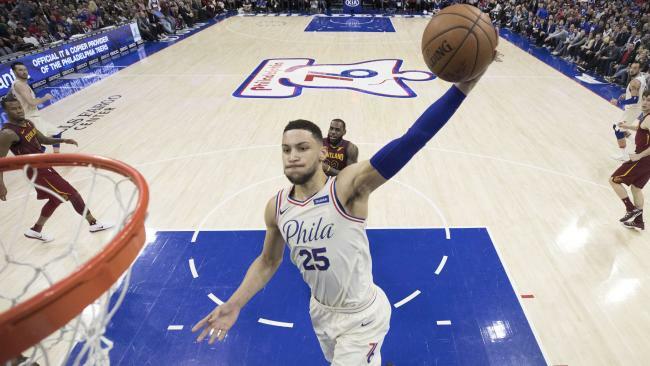 Ben Simmons keeps soaring to new sights. 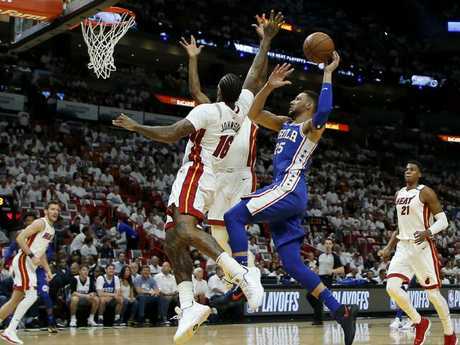 The Philadelphia 76ers have advanced to the second round of the NBA Eastern Conference playoffs, defeating the Miami Heat 104-91 to seal a 4-1 series victory. Ben Simmons also played a starring role, finishing with 14 points, 10 rebounds and six assists. In doing so he became the first rookie since Dwyane Wade in 2004 to lead his team for assists in each game of a playoff series. A fiercely contested duel at Philadelphia's Wells Fargo Center was effectively settled in the third quarter when the Sixers pulled clear to take a decisive lead. Prior to that there had been little to separate the two sides, with Miami holding the hosts 46-46 at half-time. Philadelphia eventually outscored Miami 34-20 in the third quarter, giving the 76ers a healthy buffer that Miami never came close to overturning. Philadelphia will head into the next round in a buoyant mood after an impressive all-round offensive display where five players made double figures. Simmons took a heavy tumble when Josh Richardson up-ended the Aussie star less than two minutes into the first quarter. The 21-year-old attacked the rim and as he jumped Richardson collected his legs, leaving Simmons in a dangerous position, unable to control himself as he flipped in midair. The Sixers star bounced straight back up, alleviating the fears of the home fans. Ben Simmons keeps reaching new heights. Richardson looked like he tripped, but American sportscaster Skip Bayless saw it differently. Embiid rushed in to defend his right hand man a few minutes into the third when Goran Dragic slapped Simmons in the back of the head. Dragic was tracking back after a turnover and fouled Simmons before delivering the whack, which earnt him a technical foul. Tensions threatened to erupt when Embiid came in and both camps clashed, but Simmons - just as he was after his early fall - was all class. Rather than engage and be goaded into losing his cool, he just turned his back and walked away. He didn't try to get revenge on his own. Next time Simmons was in possession he drove to the rim before getting it out to Robert Covington for a three-point attempt. This attitude, as much as his skills, is why Simmons will live up to the hype. Philadelphia has transformed its fortunes this season after years languishing near the foot of the Eastern Conference. In 2016 they finished bottom with just 10 wins and 72 defeats, but this season turned it around to finish third in the East. Also in the Eastern Conference, Al Horford scored 22 points as the Boston Celtics defeated the Milwaukee Bucks 92-87 to take a 3-2 lead in their best-of-seven playoff series. Horford finished with 14 rebounds and three assists after the Celtics built an early first-quarter lead before holding on to claim a vital win at the TD Garden. The injury-plagued Celtics have the opportunity to clinch the NBA Eastern Conference first-round series in game six in Milwaukee on Friday. Boston had led 23-15 at the end of the first period and held a 48-37 advantage at half-time. Milwaukee responded strongly after the interval but was unable to overturn its first-half deficit despite rallying to outscore the Celtics 26-20 in the final quarter. Boston's fans were made to sweat through a nervy final few seconds when an Eric Bledsoe jumper put the Bucks within three points at 87-84. But the Celtics hit back with two Terry Rozier free throws to put Boston 89-84 ahead, giving the hosts a five-point cushion they defended through to the buzzer. Khris Middleton led the scoring for the Bucks with 23 points, Giannis Antetokounmpo had 16 points, 10 rebounds and nine assists, and Jabari Parker had 17 points and eight rebounds.